If there’s one image that many cancer survivors have as they enter treatment, it’s one of going into battle. “The women and men who have to fight cancer are a modern form of warrior and have to face fears that the most people do not,” says artist Lauren Vinette, These three artists are from widely different backgrounds and experiences — one is a breast cancer survivor, one had an aunt who died of breast cancer, two are Art Bra newcomers and two have degrees in art — but they all come together with an attitude of fierceness and determination that represent all survivors. A 6-year survivor, Misty is also a veteran Art Bra artist (a gold-themed bra titled “Play Through” in 2014), considers herself an amateur artist and is thrilled to be able to give back to BCRC because it’s connected her with so many wonderful friends. Misty’s bra, “Thor, Goddess of Sky and Thunder,” was inspired by fallen Art Bra model Janelle Comiskey who exemplified a strong goddess who was so well-loved by so many people. 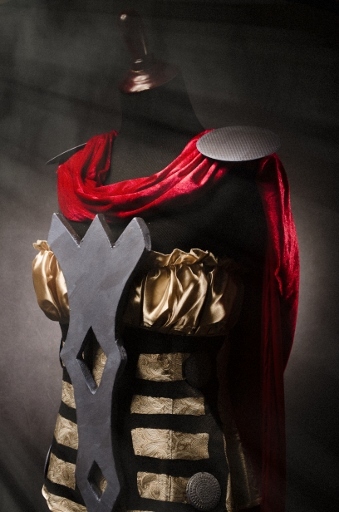 Her bra features insulation styrofoam, metal disc earrings, cloth and imitation leather for the bustier and armor, and comes with accompanying cape, hammer, gloves and headpiece. A newcomer to Art Bra, Aryes was educated at the Art Institute of Austin and says that the love of fashion has always been a driving force in her life. She was inspired to create a bra this year in memory of her Aunt Gloria who died of breast cancer, and considers it an honor to use her talents to help more women like her aunt. 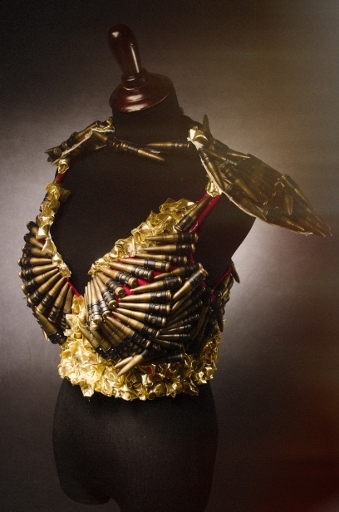 “Uphill Battle” uses dozen of plastic bullets, gold flowers, and armor as shoulder pads — all depicting beauty in the midst of pain and suffering. Aryes explains how beautiful she thought her aunt looked even though she was in pain during her treatment, and wanted her bra to show the warrior side to all survivors. Lauren is an artist and jeweler here in Austin, having attended the College of Fine Arts at The University of Texas, and although she’s volunteered for Art Bra in the past, this is her first year to design a bra for the event. Her design style tends to use a lot of geometry, so she was inspired to create a geometrically strong bra that suggests the idea of battle without actually creating armor. 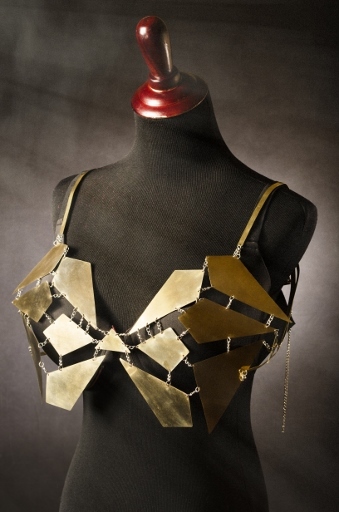 She took cues from the headdresses of Aztec warriors, and used pieces of brass sheeting and silver plated chain to construct this dramatic piece of wearable art. It comes with an accompanying pair of earrings to complete the ensemble.